Lock in a great price for Vila Vita – rated 9 by recent guests! We liked everything - staff, food, location, rooms.. But the best thing is people working there! It's the place where you want to come back! Very pleasant staff, offered breakfast was anything we would like instead of a predetermined menu. It had everything we wanted plus a big balcony. Overall it was a very plesant and relaxing experience. very helpful & friendly staff, varying breakfast served on sun terrace with view to lagoon, good restaurants nearby, fridge in room, nice forest path to the beautiful beach closeby. would recommend! This was a perfect stay. Book the room with the terrace, it is well worth it to enjoy a coffee or a beer with view of the sea. Comfortable beds, large rooms, great breakfast and kind staff who rented the bicycles for us as well. Location is perfect, close to the sea, and the centre of Joudkrante,plus a nice starting point for exploration of the forest and coastside exploration. No complaints, we shall return here. Staff very friendly. Quiet 😀 Individual breakfast. Perfect location, vey comfortable room, nice shower, amazing staff! Overall, very positive! I suggest to stay here! Has a bar with a terrace and sea view on spot to serve drinks and food till midnight! The staff was excellent: helpful and friendly. They prepared vegan options for breakfast upon request and were always ready to assist. This is an amazing hotel! Unlike many of the hotels in Juodkrante there is no road separating it from the lagoon so you can look out of your bedroom window and see the water right in front of you. It is slightly on the edge of the hotel so it is in a very peaceful location and you feel very relaxed there. We really appreciated how friendly and helpful the staff were and this helped to make our trip even more enjoyable. The breakfast was excellent and it was nice to be able to sit outside and have breakfast served to you rather than the usual breakfast buffet. The room was clean and had great facilities (TV, good wifi, good shower etc). We would highly highly recommend this hotel and look forward to returning ourselves. A very quiet hotel, with extremely friendly staff. Our room had a terrasse with sea view. Vila Vita This rating is a reflection of how the property compares to the industry standard when it comes to price, facilities and services available. It's based on a self-evaluation by the property. Use this rating to help choose your stay! 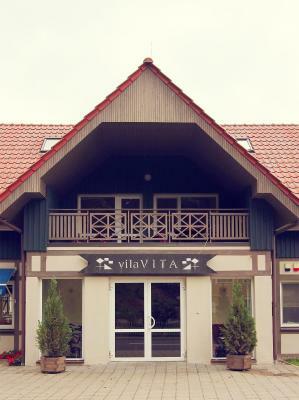 Vila Vita offers a cafe bar with a terrace and views of the Curonian Lagoon, which is just a few feet away. Wi-Fi is available in public areas. Rooms here include a bathroom with a shower cabin. An electric teakettle, TV and refrigerator are available in every room. Phone calls can be made from the 24-hour front desk, where hairdryers and ironing utensils are also available upon request. Vita Vila is in the village of Juodkrantė and guests can walk along the sand dunes to the Hill of Witches. This outdoor gallery of wooden sculptures is in a nearby forested area. 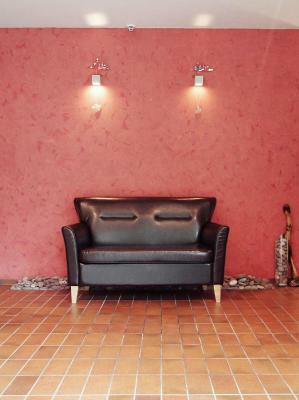 When would you like to stay at Vila Vita? A bright, elegant room done in a warm color. It includes a TV set. A bright, elegant apartment done in a warm color. It includes a bedroom, living room with a kitchenette and a balcony. This room features a view of the street. A bright, elegant room done in a warm color. It includes a TV set and a separate sleeping area. It includes a terrace or a balcony. Street side double room with a balcony. House Rules Vila Vita takes special requests – add in the next step! Vila Vita accepts these cards and reserves the right to temporarily hold an amount prior to arrival. The room was near the street, even though Neringa has very little traffic the occasional car going by was very well heard at night. Balcony has spider webs, but it did not bother us! Extremely thin curtains, and the room was facing the morning sun, it was almost impossible to get back to sleep after 5 in the morning! Double bed in my room had two mattresses, so there is a hole in between. Small fridge. Location, staff, room as in pictures.